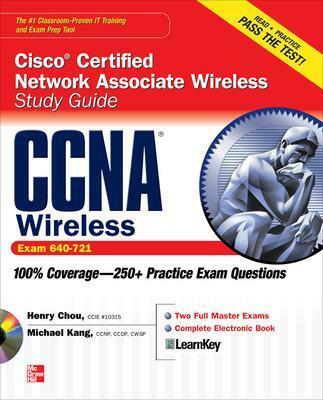 Suitable for CCNA wireless specialization, this study guide offers test preparation and the practice you need to pass this challenging exam. It helps you learn practical skills through step-by-step exercises, on-the-job elements, and chapter self-tests. It also offers coverage of... read full description below. An all-new study guide for an all-new CCNA wireless specializationWritten by Cisco insiders, this study guide offers authoritative test preparation and the hands-on practice you need to pass this new, challenging exam. You will learn practical skills through step-by-step exercises, on-the-job elements, and chapter self-tests.CCNA Cisco Certified Network Associate Wireless Study Guide offers complete coverage of all the exam topics. You can test their skills with knowledge-, scenario-, and lab-based questions. The CD-ROM includes practice exam software with 100+ questions and answers, 15+ CertCam video clips, and a complete ebook. Henry Chou, CCIE #10315, is a Solutions Architect with the Advanced Services Worldwide Wireless Practice group at Cisco Systems, Inc. Michael Kang, CCNP, CCDP, CWSP, is a Senior Wireless Network Consultant with the Advanced Services Worldwide Wireless Practice group at Cisco Systems, Inc.